Happy Independence Day! 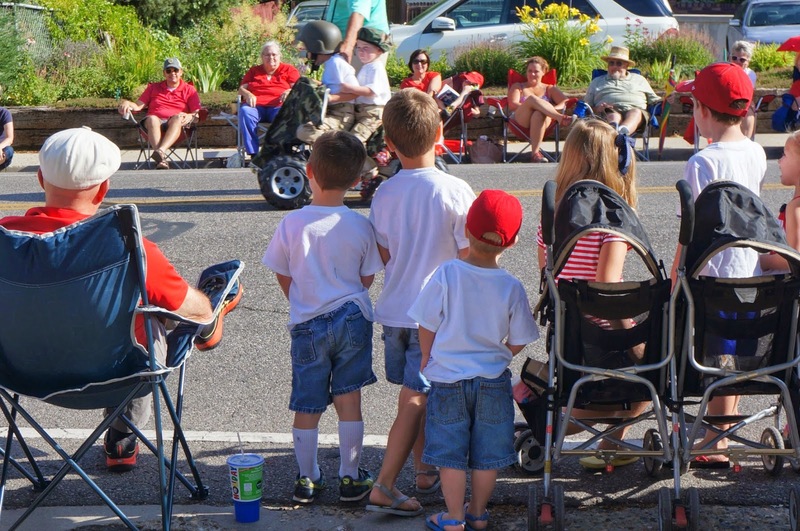 We just got home from a morning at the parade where my boys were wearing their patriotic t-shirts they made earlier this week. 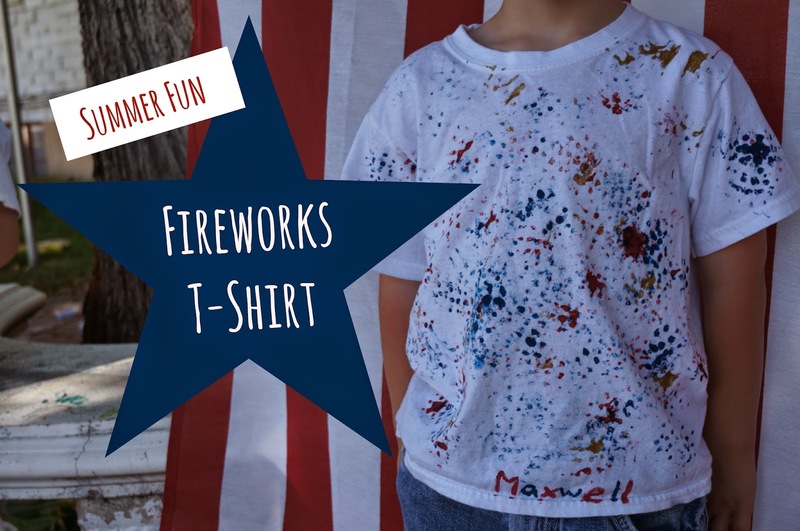 A few weeks ago, I saw an idea for a fireworks t-shirt on Pinterest. My kids all love craft projects, and this looked like something even my two-year-old could handle. Plus, I already had most of the supplies. 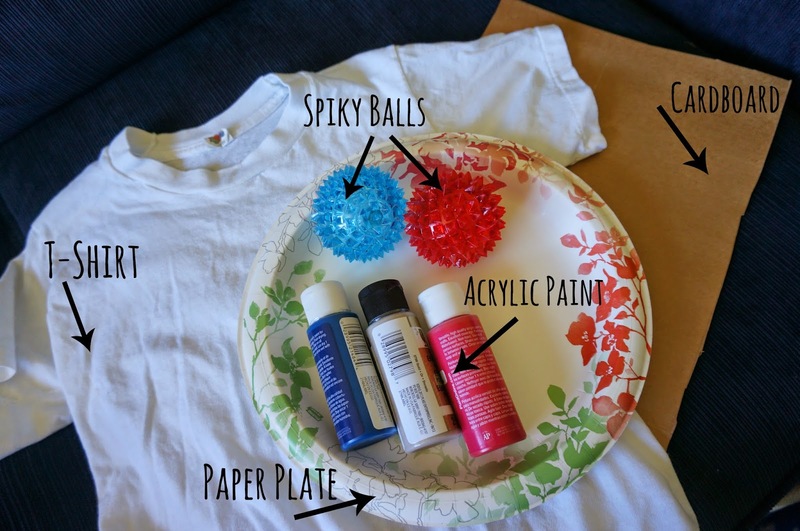 To decorate, dip the ball in paint, and then press onto the shirt. We did one color at a time, and I rinsed the balls in between. We used three colors of paint: red, blue, and gold glitter. I painted their names along the bottom edge of the shirts. I was hoping the boys would concentrate the paint in certain areas to make it look like separate fireworks. Instead, theirs look more like patriotic confetti. But you can catch the vision, right? Out of all my kids, I thought Aaron (the five-year-old) was going to be the most excited about decorating a shirt. (He loves painting and dressing up for holidays, so I thought I was well on my way to becoming his favorite mom.) But when I explained what we were going to do, he said, "I don't want to paint with a ball." "But that's the best part!" I cried. "No, it won't look good. I just want to paint with a paintbrush." I wanted to fight it because I already had everything all planned out. But then I thought, This isn't a big deal. Max and Bradley want to do it my way, so I can let Aaron do it his way. And you know what? It turned out great, and he was so happy with the result.